So Cora started out as a little diner in Montreal serving healthier breakfasts and the concept apparently took off and now we see 130+ locations across Canada. The one in Coquitlam has been around since last year and I finally got the chance to check it out. Being a kid-friendly establishments, I dragged the kiddies out for this food adventure. 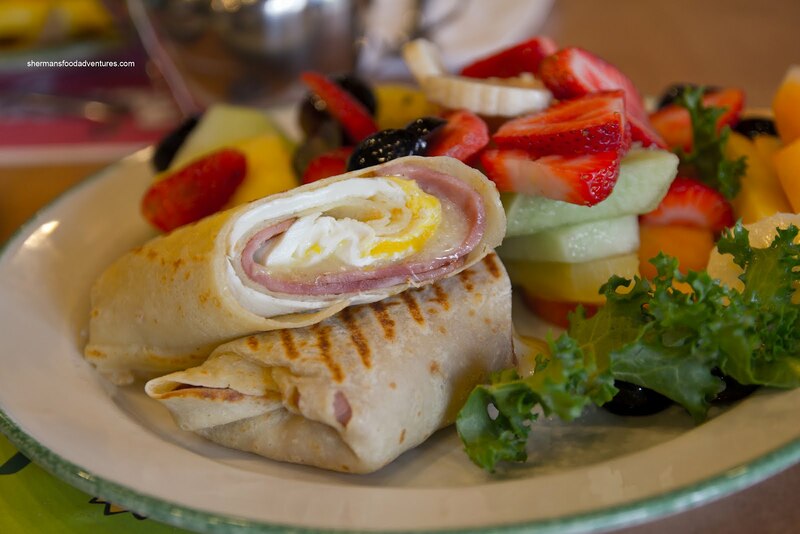 For my meal, I selected the Sunshine Panini with ham, egg and Swiss rolled in a crepe and pressed. Served on the side was a massive pile of fruit which included strawberries, pineapple, honeydew, Asian pear, kiwi, cantaloupe, black grapes and banana. The crepe panini was stuffed full and I particularly liked the barely cooked yolk. My son ended up eating half of this. The significance? He hates everything, so it must've been good right? 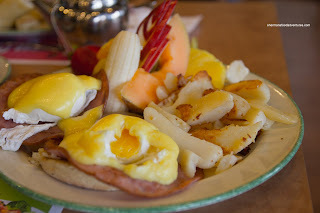 Viv went for the Eggs Benedict with ham which was also served with plenty of fruit and roasted potatoes. The eggs were soft poached with a runny yolk and were completely smothered by a thick Hollandaise sauce. It tasted rich and had only a slight tartness. It was a so-so Hollandaise in my books. The roasted potatoes seemed to have an underlying flavour of rosemary and olive oil (which the potatoes were probably coated with). They were soft, yet could've used some more colour and "roasting". 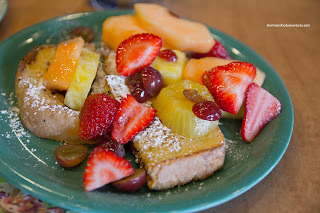 My son picked the French Toast off the kid's menu which was topped with... yes, fruit. He didn't eat the fruit, but dusted off all of the French toast. It was soft and not too eggy. My daughter had the Kid's Breakfast with scramble eggs, 2 sausages and roasted potatoes. This was pretty standard except the portion of egg could've been larger. 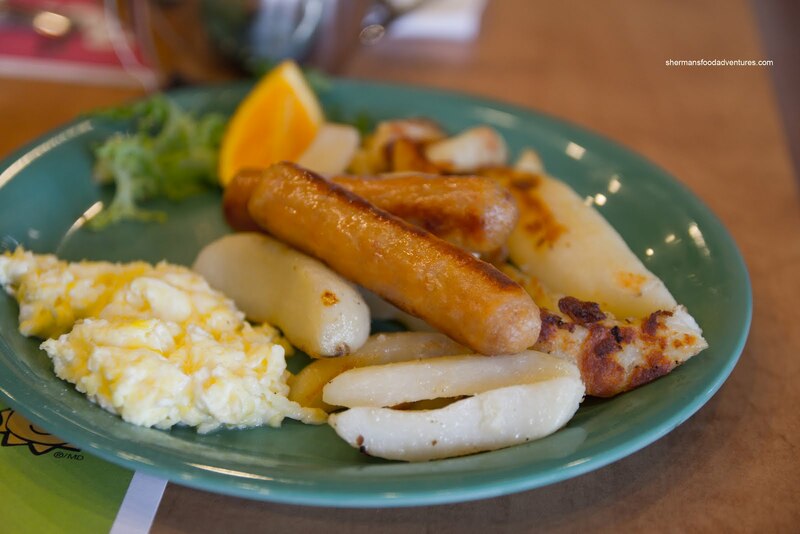 After it was all said and done, the meals at Cora were relatively more healthy than most other breakfast joints. I mean, there are still unhealthy elements, but the addition of fruit and the use of roast potatoes does help. By virtue of using so much fresh fruit, the prices reflected it. So eating at Cora ain't cheap. On the other hand, the kid's menu is reasonable where nothing is over $6.00 (includes beverage). 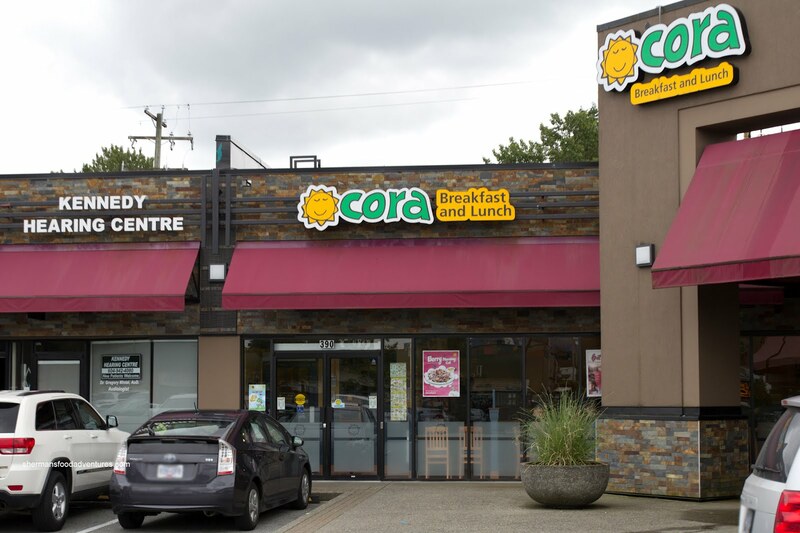 If we compare to places like Denny's and IHOP, I would personally visit Cora instead. Yet, at the same time, I would visit other independent breakfast joints ahead of Cora.